March, 1943. War is raging across the European continent. The Nazis have faced two significant drawbacks in their relentless quest for racial and geographical conquest - one at El Alamein in North Africa and the other at Stalingrad in the Soviet Union - but Hitler's war machine shows no sign of stopping. Meanwhile, halfway across the world, the largest and most secret scientific project in history is underway. A laboratory high up in the New Mexico mountains is being staffed with some of the world's best physicists, chemists, engineers, army officers and other personnel. Its express purpose is to build an atomic bomb before Hitler's scientists do so. The brilliant, conflicted Robert Oppenheimer, a polymath equally at home with nuclear physics and Sanskrit poetry, has been chosen to lead the project. He has tapped universities, industrial laboratories and other institutions across the country, recruiting the wealth of brilliant emigre scientists who have fled Nazi Germany for new shores; Adolf Hitler's greatest gifts to the United States. His well known powers of persuasion are on full display as he convinces friends and colleagues to join a secret project whose details he cannot yet fully divulge. At the top of the list of scientists who Oppenheimer wants to recruit are the Hungarian-born Edward Teller and the German-born Hans Bethe. Both have arrived in the United States during the early 1930s and are now firmly ensconced in their scientific homes - Teller at George Washington University and Bethe at Cornell University. Both men who are still in their late 30s have already made significant contributions to physics. While Teller is more comfortable contributing to the more molecular and chemical aspects of the field, Bethe has uncovered the puzzle to one of science's oldest puzzles - the source of energy in the sun. Both men have been close friends for almost a decade, and Teller has been best man at Bethe's wedding. When the war started the duo wanted to help with the country's war effort, and even though they then lacked a security clearance, worked together on a theory of shock waves (ironically, the paper was classified after it was published, thus closing off access to its own authors). Teller has also been one of the select key people responsible for sounding the alarm and alerting the government to the potential destructive applications of nuclear fission. Before Oppenheimer and Bethe had fully grasped the implications of a nuclear chain reaction, Teller had already driven his friend, Leo Szilard, to Albert Einstein's summer home in Long Island for what turned out to be a fateful meeting. Szilard had convinced his old friend Einstein to draft a letter to President Franklin Roosevelt; that letter had set the wheels of our nuclear future rolling toward their uncertain destination. Teller is thus one of three or four people, mostly Hungarian emigre scientists, to have been in the loop since the beginning as far as nuclear weapons are concerned. Along with Bethe, he has also been part of a summer study in Berkeley in 1942 led by Oppenheimer in which a handpicked group of physicists worked out the preliminary principles of a fission bomb. More than almost any other scientist and certainly more than Oppenheimer and Bethe, Teller has lived with the bomb since 1939. In fact Bethe did not even believe in an actual bomb until Teller showed him Enrico Fermi's famed nuclear reactor at the University of Chicago in late 1942. Now, in March 1943, Oppenheimer is in the process of making some key strategic decisions that would shape the organization of the Manhattan Project. Among these decisions, few are as important important as deciding who to put in charge of the theoretical physics division at Los Alamos. It was theoretical physicists who first worked out the feasibility of a nuclear chain reaction, and it would undoubtedly be theoretical physicists who would continue to play a foundational role in the success of the project. Teller, having lived and breathed the bomb, having contributed to both its politics and its science, having seen the vision of its even more powerful descendant (a bomb drawing its energy from nuclear fusion), thinks of himself as a logical choice to head the division. Oppenheimer instead picks Bethe. It's an omission Teller will not forget. The decision would have far-reaching consequences for the organization of the Manhattan Project. It would sow the seeds of discontent that would fracture the community of American physicists a decade later. And it would drive home the interplay between management philosophies and the mechanics of complex technological projects that is relevant to this day. Why did Oppenheimer pick Bethe instead of Teller, and what does this decision say about his own management style and about those of Teller and Bethe? Teller and Bethe actually shared similar backgrounds. Both were born in the early years of the 20th century to cultured and educated middle class parents in Hungary and Germany. Both were seized by a passion for mathematics and physics, and studied the subjects under two world-class masters of the trade: Teller with Werner Heisenberg in Leipzig and Bethe with Arnold Sommerfeld in Munich. Coming as they did from enlightened Jewish families, both became ominously aware of the noose of fascism tightening around Germany in the early 1930s, and left for the United States where they established leading centers of physics research and study. Unlike many American scientists who had led relatively tranquil lives until then, Teller and Bethe were acutely sensitive to the spread of totalitarian regimes, and they grasped the political implications of the chain reaction before many others. But Teller who had seen both Nazi and Communist occupations was the more sensitive of the two, and this awareness led him to be an early proponent of American dominance in nuclear weapons. It was at a conference organized by Teller and his fellow physicist, Russian emigre George Gamow, that Niels Bohr brought news of fission to American shores at the end of 1938. But there the similarities between the two physicists ended, and it was their differences that led to their very different and fateful life trajectories. Throughout his life Teller was known to be as volatile and moody as brilliant. He was often short-tempered and brooding and could not always be relied upon to carry calculations to their fruition; while to be fair to him he fully recognized this quality, most of his papers were with collaborators who made sure his calculations were fully fleshed out and correct. Teller later classified physicists as 'brick builders' and 'bricklayers', and called Bethe a 'builder of tiny bricks'. In his view his own skills as well as those of Oppenheimer were more suited to bricklaying. Interestingly, both men's bricklaying was more inspired than thorough, brilliant than always right. Their personalities too shared commonalities: both of them could be sharp-tongued, vicious and unpredictable, charming at one moment and cold at another. Bethe in contrast was one of the most thoroughgoing scientists of the twentieth century, a steady rock of Gibraltar in both science and life. He could meticulously carry through every task to completion; in the 1930s he single-handedly authored a comprehensive survey of nuclear physics running to hundreds of pages that was so all-encompassing and up to date that it became known as 'Bethe's Bible'. He was also a universalist who could solve problems in almost any branch of pure or applied physics. Renowned for ploughing ahead through obstacles and going straight for the solution, his colleagues fondly called him "The Battleship". Stability and wholeness exemplified his personal and professional lives. Unlike Oppenheimer and Teller he was almost always mild-mannered and diplomatic, gentle if firm in his opinions. 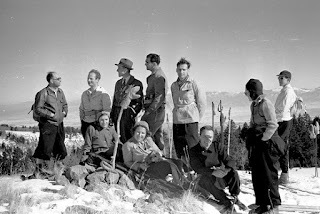 Los Alamos with other scientists such as Enrico Fermi. Given these highly desirable personal qualities, it should come as no surprise that Oppenheimer picked Bethe instead of Teller to head the theoretical division. Bethe's take on the decision recognizes Teller's contribution but also drives home the requirements of the project at this stage and Bethe's suitability for these requirements. "That I was named to head the division was a severe blow to Teller, who had worked on the bomb project almost from the day of its inception and who considered himself, quite rightly, as having seniority over everyone then at Los Alamos, including Oppenheimer. I believe I was chosen because my more plodding but steadier approach to life and science would serve the better at that stage of its development, where decisions had to be adhered to and detailed calculations had to be carried through, and where therefore a good deal of administrative work was inevitable...I believe Teller resented my being placed on top of him." Teller's assessment of Oppenheimer's choice is unsurprisingly critical: "Bethe was given the job to organize the effort, and in my opinion, in which I may well have been wrong, he over-organized it. It was too much of a military organization, a line organization." Considering the fact that an explicit military style organization was rejected by Oppenheimer and weekly open seminars were set up to avoid compartmentalization, it's hard to substantiate Teller's opinion. Moreover, there is no evidence that Bethe's leadership of the theoretical division was anything but highly accomplished. Implosion, computing, the gun-type bomb design; everything proceeded smoothly under his direction, and during the process he also led outstanding theorists like Richard Feynman, Stan Ulam and Robert Serber. Feeling sidelined by Bethe's appointment, nursing his passionate dream of a fusion weapon, increasingly loathe to do the kind of detailed calculations that Bethe's group was good at, Teller finally asked Oppenheimer to relieve him of his position in Bethe's division. He spend most of the rest of the war largely thinking about what became the hydrogen bomb. Unlike Bethe's role, Teller's role at Los Alamos was not indispensable. He made some valuable contributions in calculating the behavior of imploding plutonium cores at superdense pressures, but beyond this he seems to have mainly focused on his pet project and kept half a dozen Nobel Laureates awake at night by playing the piano. Strikingly, the one thing that stands out even from the embittered Teller's view of Los Alamos is his outstanding paean to Oppenheimer's leadership. Especially considering his growing animosity toward Oppenheimer and the general resentment he must have felt, this tribute is nothing short of profound and speaks to Oppenheimer's extraordinary role in making Los Alamos work. "Throughout the war years, Oppie knew in detail what was going on in every part of the laboratory. He was incredibly quick and perceptive in analyzing human as well as technical problems. Of the more than ten thousand people who eventually came to work at Los Alamos, Oppie knew several hundred intimately, by which I mean that he knew what their relationships with one another were and what made them tick. He knew how to organize, cajole, humor, soother feelings - how to lead powerfully without seeming to do so. He was an exemplar of dedication, a hero who never lost his humanness. Disappointing him somehow carried with it a sense of wrongdoing. Los Alamos's amazing success grew out of the brilliance, enthusiasm and charisma with which Oppenheimer led it." Not a bad tribute to a man who, when he was appointed to lead the project, left almost everyone astonished and dismayed because of his lack of experience. A man who had not even led a university department and who, in the words of one of his eminent colleagues, was "not fit to run a hot dog stand." A man who lacked a Nobel Prize but who was asked to lead a group of the world's most brilliant physicists, many of whom would either win or had already won a Nobel Prize. And yet Oppenheimer seems to have blown everyone away, and this includes men like Bethe and Fermi who were far from easily impressed; Bethe said that Oppenheimer was "intellectually superior" to everyone at Los Alamos. "He did not direct from the head office. He was intellectually and physically present at each decisive step. He was present in the laboratory or in the seminar rooms, when a new effect was measured, when a new idea was conceived. It was not that he contributed so many ideas or suggestions; he did so sometimes, but his main influence came from something else. It was his continuous and intense presence, which produced a sense of direct participation in all of us; it created that unique atmosphere of enthusiasm and challenge that pervaded the place throughout its time." Oppenheimer's quintessential quality in doing all this seems to have been that of an actor, a man who could always wear whatever role history had chosen for him like the finely tailored three piece suits which his wealthy New York father's trust fund allowed him to indulge in. Some of his qualities had been on display when he was a highly regarded professor at Berkeley. It seemed he was acutely tuned to the wishes of everyone in the room. His martinis were spicy and his parties famous for their joie de vivre, and his immensely wide knowledge of esoteric subjects like Sanskrit and 17th century French poetry mostly seemed to amplify his charisma. There were a few people who found him pretentious, but these were in the minority; his students emulated his mannerisms. 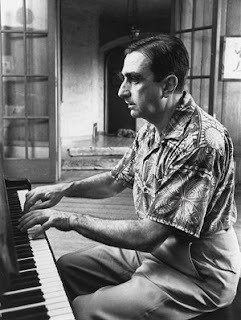 At Los Alamos he was at the peak of his powers, and his instant grasp of every technical and human matter, lightning fast mind and ability to connect with everyone's problems seem to have charmed even Edward Teller. When the war ended, Bethe, Teller and Oppenheimer went their own ways. 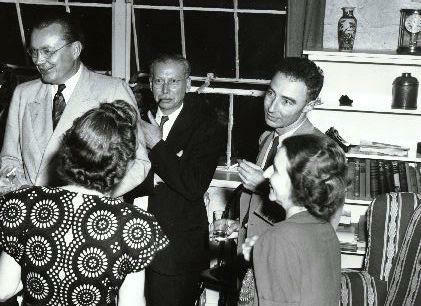 Oppenheimer carried over his Los Alamos charm to the leadership of the Institute for Advanced Study in Princeton, where he presided over the likes of Einstein, Godel, and von Neumann. Unfortunately the same powers of persuasion that had been so effective at Los Alamos did not work so well in Washington's corridors of power. Oppenheimer made enemies among politically well-connected men who accused him of hindering the country's hydrogen bomb program. Their unconstitutional tactics and allegations of guilt by association combined with his own equivocation on some of his left wing history and casual arrogance led to a hearing in 1954 and brought about his downfall. He spent the rest of his life speaking out on the philosophy of science and on the relationship between science and society, still efficiently leading the Princeton institute and evoking admiration around the world. Bethe spent the rest of his career - all 60 years of it - at Cornell University. In the process he elevated Cornell to a world center of physics, advised half a dozen presidents on nuclear arms control, and kept on doing significant scientific work well into his 90s. The same qualities of steadfast stability and integrity that had been on display before served him exceedingly well during the politically tumultuous times of the Cold War and gained him the admiration and loyalty of scores of friends and colleagues. Just like Oppenheimer, he became a wise man whose advice fueled and reassured the hopes of others. Teller's trajectory was less tranquil. He became the century's most vocal proponent of nuclear weapons and spent most of the next decade obsessing over the hydrogen bomb. He started a rival laboratory which competed with Los Alamos in building the next generation of lethal nuclear weapons, and his own brand of volatile proselytizing drew the admiration of a select group of mostly right wing scientists and politicians. Like Bethe he became advisor to conservative presidents and was a key force in advocating the ill-fated 'Star Wars' weapons system during the Reagan administration's tenure. Most importantly, his fateful testimony against Oppenheimer during Oppenheimer's security clearance hearing was considered an act of betrayal by the majority of the scientific establishment. While Teller lost many of his friends as the result of his testimony, this also allowed him to shed past aspects of his life and make new friends who were more sympathetic to his cause. By most standards Teller with his volatile temperament and inability to carry projects through to their conclusion should have been largely unsuited for leadership. And yet there was another side of him, a side that could charm and display loyalty. This side could allow him to occasionally perform the function of inspiring others which most of us expect from a good leader. It was a side that was on full display when he became part of a team put together to design an intrinsically safe nuclear reactor, one whose safety features would depend not on the IQ of the operator but on the natural laws of physics. Teller was not technically the leader of the team. The leader was a physicist named Frederic de Hoffmann who along with Teller, recruited other brilliant scientists like Freeman Dyson. In his biography, Dyson praised the fun and inspiration that Teller brought to the project. He had interacted with Teller at the University of Chicago before and liked Teller's playful attitude toward physics; Dyson thought Teller was a man who did physics for fun rather than glory. That attitude seemed to be particularly visible during the reactor project. "Working with Teller was as exciting as I had imagined it would be. Almost every day he came to the schoolhouse with some hare-brained new idea. Some of his ideas were brilliant, some were practical and some were brilliant and practical. I used his ideas as starting points for a more systematic analysis of the problem...I fought with Teller as I had fought with (Richard) Feynman, demolishing his wilder schemes and squeezing his intuitions down into equations. Out of our fierce disagreements the shape of the safe reactor gradually emerged." What lessons do Bethe, Oppenheimer and Teller hold for present day managers and CEOs? Today's CEOs face the same problem that Oppenheimer faced. They have to direct the work of a large group of scientists and other personnel of diverse skill sets and temperaments. They have to soothe egos and give everyone adequate freedom to pursue their ideas while still constraining them to meet project guidelines. They have to please shareholders and the general public. And they have to do all this without appearing to do so, without giving the impression of being heavy handed and dictatorial. From Oppenheimer they can learn the value of keeping on top of all aspects of a project, whether managerial or technical, and for being informed enough about the role of every person to assure that person of their importance to the team. Like Oppenheimer at Los Alamos, they also have to inspire people to give their very best and to inject enthusiasm and hope into the work especially when things are not going well. And just like the technical seminars at Los Alamos which encouraged open and free discussion, they have to let everyone voice their opinions. From Bethe they can learn the vital importance of being technically accomplished even as an administrator, and of the importance of perseverance and meticulousness. One of the laments about the present day pharmaceutical industry for instance is that too often you have CEOs with MBA degrees who have little understanding of the great technical challenges of biotechnology or drug discovery. A Hans Bethe would have combined deep knowledge of the science with a plodding and careful approach to getting things done. In addition he would have combined geniality with a gravity that was inspiring rather than intimidating or depressing. Just like Bethe, the best CEOs would combine technical excellence with outstanding managerial capabilities, and even CEOs without a technical background should learn enough of the technical material to empathize with the scientists in the trenches. Teller exemplifies a different kind of lesson for today's CEOs. In an age where employees are often supposed to fit a particular mold, Teller provides a refreshing example of someone who constantly tried to think outside the box. People like Teller provide a unique function in an organization by frankly speaking their mind and pushing the envelope on what can be achieved. They are useful in shaking up everyone's conventional thinking and charting new directions. Not all their ideas work, but the ones that do can lead to novel horizons. They need to be guided by good managers like Oppenheimer and Bethe who can make them work harmoniously with other employees. These employees in turn must have the patience to actually implement the ideas of Teller-like minds. As long as the Tellers of the world are not allowed to go rogue, they can actually be valuable additions to all kinds of organizations. What matters is whether there is an Oppenheimer or Bethe to lead the way.